I've had a couple of pretty special-looking LPs and tapes in the post recently, but I thought this release particularly deserved a good blogging. Art Is Hard is a South Coast label, mainly promoting South Coast bands, but with the odd one or two from further afield. I heard of them a while back, when they put out their first compilation, as a t-shirt with download, which featured some great now-defunct Bournemouth bands like Dutch Husband and True Swamp Neglect, as well as the much-more-currently-active likes of Colours and Kinnie The Explorer. And then, whenever I saw Lee Dutch, he would inevitably be wearing the t-shirt, so it was kind of hard to forget about them! Now, it's 2012, and they seem to have not gone away yet, and are seemingly boasting an ever-more impressive roster (Yrrs and Black Tambourines currently doing it for these ears). 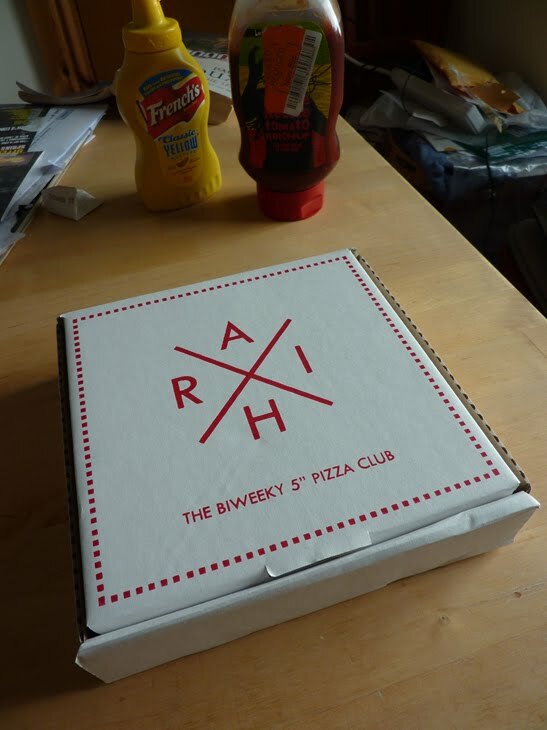 Over at their Bandcamp, they've been running the Art Is Hard Biweekly 5" Pizza Club for a few weeks now. Basically, every second Friday, they put up a track for free download, with only one physical copy available to buy, at 1pm on the day. I somehow managed to snag a recent one, and so was the lucky recipient of a tasty-looking burrito pizza CDR, carefully packaged in this amazing (and much bigger than I'd expected!) 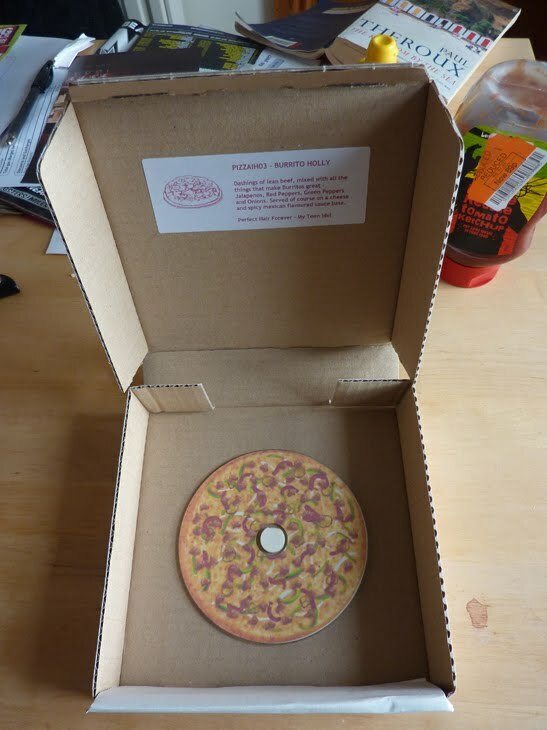 pizza box. The CD is My Teen Idol by Perfect Hair Forever, apparently from New Zealand. It's some of that retro recorded-on-a-lolly-stick surf sound that all the cool kids dig. You can hear that, and the other pizza club tunes, at the Art Is Hard Bandcamp. But I'd recommend also visiting the Perfect Hair Bandcamp, and checking out the whole EP that the tune comes from - beautiful stuff! Art Is Hard, well, they're on Facebook too. Yeah? Thank you Art Is Hard. yeahHH!!! COMING SOON: KEEL HER + perfect hair forever split EP!! or 7"
Ah, great news! I think I ♥ them. And I already have too many Keel Her tapes. Roll the vinyl!